Vita Spa retailers have been inspired to fire up their UK sales and hit top gear this year after taking part in shooting practice and dune buggy racing as part of a busy USA factory visit schedule. Showroom preparations are now in full swing to ensure Vita Spa product knowledge gained from the Phoenix factory tour pays off. 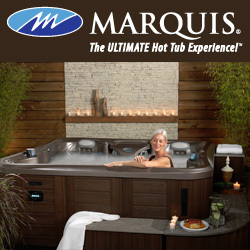 It is run by the MAAX Spas Corporation that has recently acquired the L.A Spas range of models to add to its growing stable of hot tub brands owned by Brookfield Asset Management, a global enterprise with over $100billion in assets. During the pre-Christmas factory visit, organised by Vita Spa UK distributor Richard Hart and his Chelmsford-based Aqua Warehouse Group team, retailers were given an insight into the production process of the cutting-edge functionality of the Vita Spa models, including WhatSpa? Best Buy Award-winning five-seater Elegant and six-seater Prestige, which are achieving success thanks to their galvanised reinforced steel frames that are appliance grade and have a lifetime-warranty. The tour also allowed the manufacturer to highlight its latest developments, as well as the production process for the Vita Spa XSP, which comes in at 5.01 x 2.28 x 1.35m and has achieved its first WhatSwimSpa? Best Buy Award in the £15,000 to £22,499 price range with a verdict that stated that it was a worthy winner ‘that offers great value for money’. It is the big brother of the XL4 and part of the Vita Spa Aquatic Swim Spa range, which is allowing retailers to promote a combination of the best elements of swimming pools, hot tubs and home gym workouts. “The trip provided the opportunity to preview the latest Vita Spa developments for 2015 and meet the team responsible for producing our quality product,” explained Richard, who is now also responsible for the L.A Spa distribution process in the UK. MAAX Spas Director of Business Development James McClure believes the UK-based Vita Spa dealers are now achieving success thanks to a number of years of sustained manufacturing development and high-profile promotional activities for the brand both in the USA and Europe. “Since we acquired the Vita Spa brand we have enhanced the whole manufacturing process for the entire range of models and it has been paying off in the past couple of years with high levels of increased sales,” said James. “Richard has done a fantastic job distributing Vita Spa in the UK and he has a great network of hard working dealers that once again achieved tremendous sales during 2014. 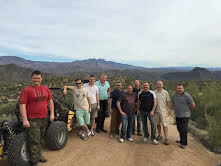 Although like any factory tour there is a serious element involved, Richard reported that it was also aimed at providing some well deserved fun in the Arizona dessert for his hard working dealers, who are pictured at the buggy racing leg of the ‘jam packed’ schedule. “The short visit had a jam packed itinerary designed for fun and team building with excursions to a ShootingRange and Buggy Racing in the desert,” revealed Richard, who promoted the Vita Spa range to the trade and consumer audience at the UK Pool & Spa Expo this year. Filed Under: Factory visits, News, News & views Tagged With: Aqua Warehouse, hot tub retailers, UK Pool & Spa Expo, Vita Spa, WhatSpa?, WhatSwimSpa?